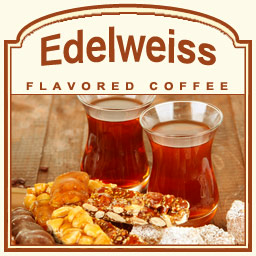 The Edelweiss flavored coffee is a true gourmet treat. A flavor that features roasted pecans, sweet cream, and caramelized sugars, this Edelweiss flavored coffee is also enhanced by Swiss almonds and the full-bodied, fruity flavor of Mexican liqueur. Although there is no alcohol in this delicious flavored coffee, the exceptional Edelweiss flavor is a delicious burst of bold sweetness. In a heat-sealed valve bag, we ensure the freshest coffee possible � fresh roasted and shipped on the same day. If you like your coffee full-bodied and decadently roasted to perfection, look no further than the authentic Arabica beans in the Edelweiss flavored coffee creation! Mmm � good!